For many generations, the record player is a symbol of youth, rebellion, and a love of good music. For a while, it was seen as an outdated product, but in recent years it really has made a comeback. The younger generations are in love with the classic record player, and more and more are being bought all the time. A record player is perfect for enjoying at home in your own time, for sitting back and closing your eyes after a long day so that you can relax. However, if you are having friends over or throwing a party, they don’t always get quite loud enough. This is where the advantages of having a record player that works with a pair of external speakers come in very handy. They allow you to experience more volume, a wider range of sounds, and for you to truly live out the music that you love so much. It’s not always easy to know which turntable to pick, or which is going to be right for you, but we are here to give you a hand with things. 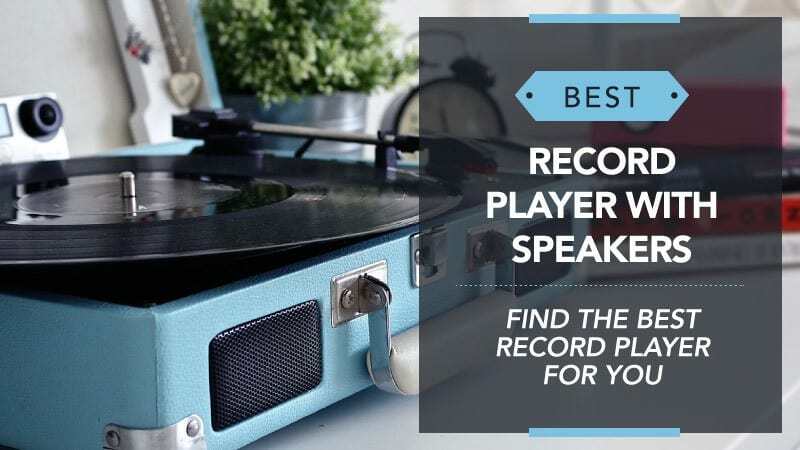 In order to help you find the best record player with speakers, we have put this guide together, compiling all of the relevant record players with speakers reviews in one place, so you can share the music you love with everyone. 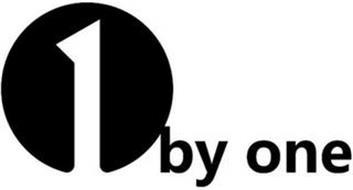 1byOne is an excellent brand, as well as one that understands sometimes you need a lower price for a good quality item. This particular record player ensures that budgets can be met, while also providing clear sound and a model that keeps in line with their usual standards. Take a look and see for yourself. This record player has a classic wooden finish that leaves it with a truly retro feel, as well as detailing in black for good contrast. It has a chunky build, but this also means that the controls are located on the front and incredibly easy to access – everything from the volume, to the power and USB port/controls. The speakers are also built into the front without compromising the overall design. The speakers themselves offer a clear sound that really lets you have fun with the music, so you can get dancing and celebrate in the way that suits you best. However, it also has a port that lets you connect it to your own speakers. There are three speeds as well, allowing you the full range so that you can listen to your entire record collection. Plus, the USB port allows you to convert vinyl tracks into digital files. There is no bass, and some customers have found the USB difficult to use correctly. This record player is amazing value for money, and it comes at a price that you just can’t beat. The instructions for setting it up are nice and clear, and it offers you all of the basic features you need to get started. There is no bass, but considering the low price this is to be expected, and the music is just as great without it. Once you get used to the USB conversion process as well, things will be much smoother and simpler. With clear speakers built into it, as well as the option to connect to external ones, this could just be the turntable you have been searching for. Ion is another reputable brand, and if you want to take your record player across the UK with you, then why look any further? 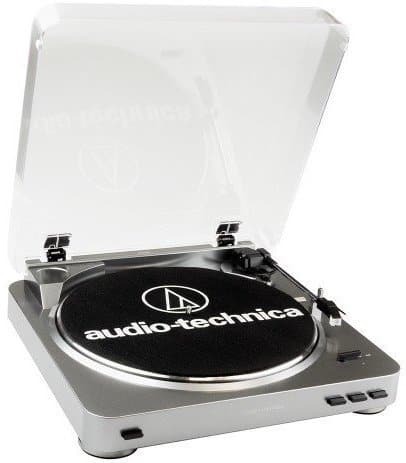 Made to be portable as well as practical, this turntable has everything you need and more. Take a look below and see if this model is going to be the right match for you. This great little record player has a gorgeous and retro wood finish as well as a smooth black base that will leave it looking fantastic anywhere you place it. You also have the option for a regular piano black if that’s something you prefer. The controls are very simple, with a slim knob on the main area of the player for volume, and the sockets neatly placed on the back so that they are out of sight. The speakers are discreet, but their small size means nothing when you turned the turntable on – the room fills with sound, and it offers a truly wonderful experience. With three speeds, all of your music can be listened to without any issue. There is also the option to plug into your own external speakers if you prefer, as well as a USB port so that you can convert your vinyl tubes into digital files. Some customers have found that the conversion software requires you to split the tracks manually as it does not always get it right. The speakers also offer no bass. 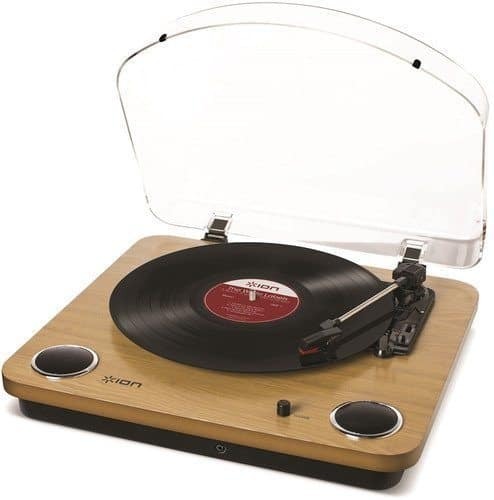 This affordable record player comes at a great price and from a top brand, with a set of speakers that will allow everyone to enjoy the music they love. While the software included may require some manual intervention, this is not as time-consuming as you might think. Plus, the fact that you can plug into your own external speakers means that you can have bass if and when you want it. Overall, it offers you so much – three speeds, smooth playing, and a portable size – and it certainly worth the price. Back to 1byOne, this record player allows you to enjoy music both inside and outside of your home. If you need that balance between portability and a model that looks good in your home, this could be the one for you. Take a moment to read the reviews below and see what you think of it. Sporting a traditional look, this record player radiates style, and it will look amazing in any corner of your home. Made with a matte wood base, the rustic feel adds a little warmth, bringing back fond memories when you lower the arm. There is a small control panel on the top, keeping things discreet while also ensuring they are easy to access. The volume knob is across from them and is easy to use. It has three speed settings and a dust cover, ensuring all the basics are there and ready for you. With a modern twist, it features Bluetooth so that you can stream all of your favourite songs effortlessly through the built-in speakers. It even allows you to convert your records into digital files. Despite all of this, it still remains fairly light and easy to take with you – making it a truly portable and reliable piece of kit. Some customers feel that the built-in speakers are a little tinny and have no bass. This turntable comes at a reasonable price, especially when you consider all the extra features that have been packed into it – like Bluetooth. While there are some that feel the speakers are a little tinny and miss the lack of bass, the record player can be plugged into external speakers as well, so you can get a quality player with the advantage of interchangeable speakers. With a great look, easy portability, and a great system overall, this really is a steal. Here are some further models of record players with speakers, just in case the ones above do not quite meet your requirements. This USB turntable has a really stylish look, with a sleek silver that will dazzle in your home. The slim design makes it both lightweight and portable, which is ideal for those who want to take it out with them or just need something that doesn’t weigh a ton. The USB output allows you to connect it to your PC or MAC with ease, providing quick streaming so that you can experience all of your favourite tracks with a retro twist. It even comes with a set of cables for connecting to your external speakers or stereo. 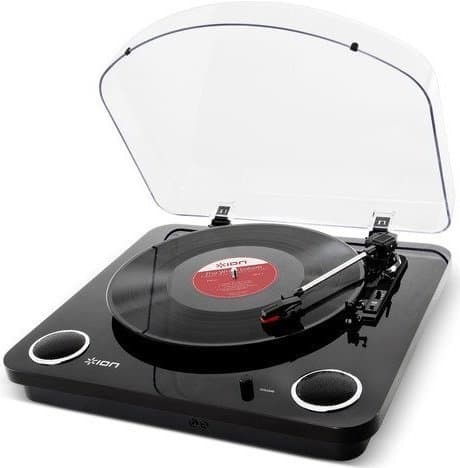 The turntable itself is fully automatic, and it has two speeds for you to choose from – as well as a stylus that you can replace if anything happens to it. Plus, it comes at a pretty reasonable price when you consider how much it offers. Swinging back to Ion again, this turntable comes in two colours – classic black or a wonderfully retro wood. 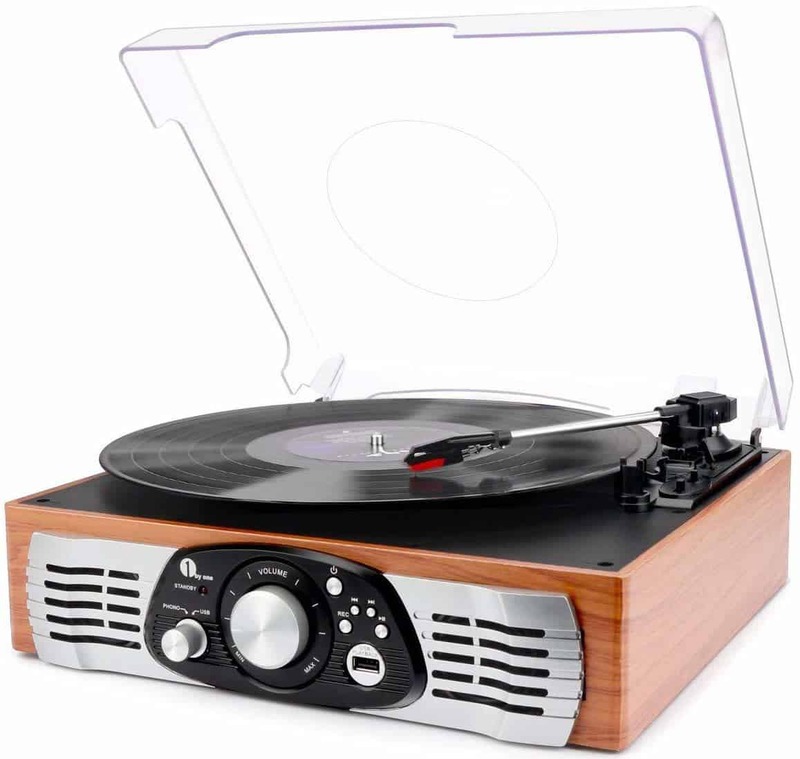 It has three speeds that you can choose from, and is also fully automatic, so you can enjoy every record in your collection with ease and simplicity. The slim and light design makes for a portable and compact model that can be taken with you anywhere. The USB port allows for a smooth connection to your PC or MAC, so you can stream the music you love straight from your computer for some modern music with a retro feel to them. Additionally, the AUX input means that it can be hooked up to your external speakers or stereo for music that can really be blasted through the house – getting everyone up on their feet and dancing. It allows you to convert your records into a digital file, and for the price, it really does give you value for money. Hopefully, this guide has helped you to find the best record player with speakers, and that the record player with speaker reviews have given you some guidance when determining which one is going to give you the best sound quality, as well as allow you to play all of your music with ease. 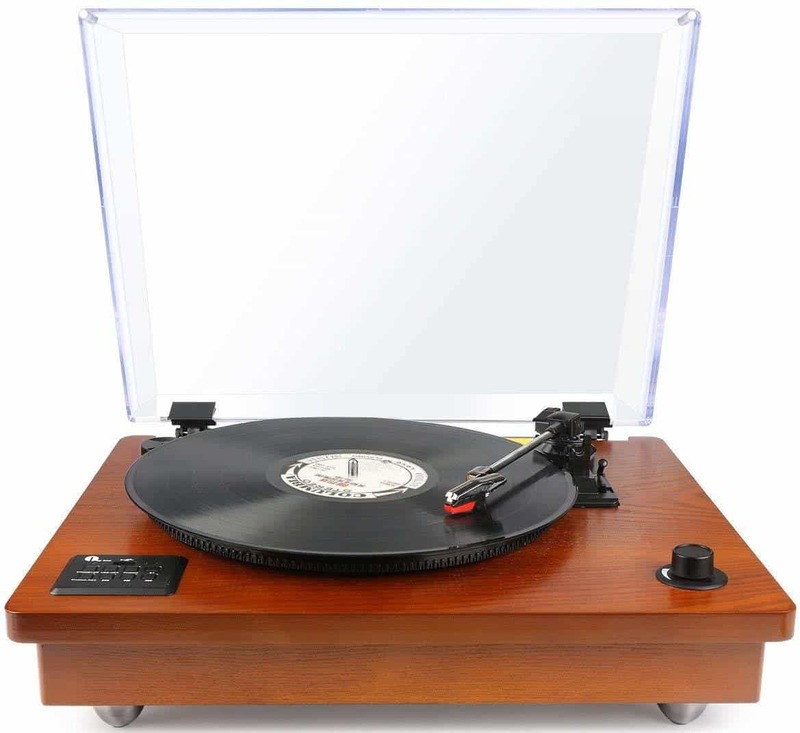 One thing that we understand is being able to get that all-important hit of nostalgia while you listen to your favourite tracks, and that is something you can achieve with the right record player. Each of the models here is compatible with a set of speakers, so you can play the songs you love loud and proud for everyone to hear. Additionally, we have chosen models that not only come from brands that are reputable, but also at a range of prices so that you can find one to fit in with your budget. What did you think of our record player guide? Are there any that you would have liked to see or recommended? We love hearing from you, so make sure to leave us a message in the comments below.